Now that it has become obvious that former President Olusegun Obasanjo, who has always supported whoever emerged president is interested in a change of leadership in Aso Rock, the battle now is who becomes the candidate of the opposition to face President Muhammadu Buhari of the APC. Who among the top contenders will emerge? By this time four years ago, the Peoples Democratic Party was battling to hold on to its precious members. Despite being the ruling party at the centre at that time, the party was not considered priceless to some of its die-hard members, who were then considered as its first eleven. In droves, they trooped off from under its umbrella to pick the broom of the All Progressives Congress. The mass exodus that hit the PDP then which was arrogantly managed by the national leadership of the party, made it to become the opposition party in 2015. It was the first time the party, which had proudly boasted that it would rule for 60 unbroken years at the centre, tasted defeat at the federal level. Almost four years after, the party had yet to recover from the shock bestowed on it by the disappointed electorate and its members. Conversely, things seem to be changing for the once rejected stone, as some of those who had earlier pronounced it dead in 2014, have returned to give life to it. Their action was largely sequel to the treatment they allegedly received from the APC, which they helped formed. The ruling party came as a result of merger of three major political parties, which were the defunct Action of Nigeria, All Nigeria Peoples Party and Congress for Progressives Change. The joining of the trio by a faction of the PDP, then known as the New PDP, solidified the APC and made it potent to deal a deadly blow on the then ruling party during the 2015 elections. The celebrations in the new ruling party however became sour when it was time to enjoy perks of office, after the APC formed the government. Majority of those who felt that their lots would be better in their new abode allegedly experienced disappointment. Hence, one after the other and like the Biblical prodigal son, they have been returning to the party they once disparaged and called awful names. Interestingly, majority of those who led the exodus team then and have retraced their steps, are also among the aspirants seeking the presidential ticket of the party. 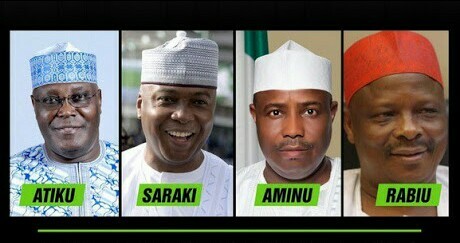 Notably among them are a former Vice President, Atiku Abubakar; a former Speaker of the House of Representatives and Governor of Sokoto State, Aminu Tambuwal; a former governor of Kwara State and President of the Senate, Dr. Bukola Saraki; and a former Governor of Kano State, Senator Rabiu Kwankwaso. Those who remained behind in the party and refused to be debased by the mass departure then and are now seeking the presidential ticket are a former Governor of Kaduna State, Senator Ahmed Makarfi: Governor of Gombe State, Ibrahim Dankwambo: a former Governor of Jigawa State, Sule Lamido and an Entrepreneur, Datti Baba-Ahmed and a former Minister of Special Duties, Tanimu Turaki (SAN). The duo of a former governor of Sokoto State, Attahiru Bafarawa and a former governor of Kano State, Ibrahim Shekarau though initially of the non-operational ANPP, have remained with the PDP. Both of them are also seeking to fly the flag of the party during the February 14, 2019 presidential election. The Governor of Ekiti State, Mr. Ayo Fayose, who was the first to declare his presidential ambition, is believed to have fallen by the way side from the race. Besides being considered as not very optimistic about realising his dreams, the PDP, of which he is the chairman of its Governors’ Forum, has zoned the ticket to the northern part of the country. Thus, some consider the declaration by Fayose as another razzmatazz. No doubt, the calibre of political bigwigs who have returned to the PDP, and the qualities of those considered as ‘landlords’ in the party, may have compounded the problem its national leadership is probably facing in choosing who will face the presidential candidate of the APC, President Muhammadu Buhari, in 2019. All the aspirants, who have openly announced their ambition, have pronounced themselves the best candidate for the race. Almost all of them also see President Buhari as a candidate they can defeat, if fielded by the party. “I can match President Buhari’s integrity for integrity and I have what he does not have: I have education, I have knowledge, I have the fear of God, which he doesn’t have. Even if you have a good sales team, you need a good product. And I am that product. I can assure you that I am not made in ‘Taiwan’. “Since 2015 that we lost the election, many things have changed. It is no longer about the platform alone but also about the candidate. We must be able to come up with a candidate that has strength of character to wrestle Buhari and pin him to the ground (should he emerge the APC presidential candidate),” Turaki boasted. Atiku, who has also been meeting delegates across the country, believes no one is better suitable for the ticket than himself. Though he says he is qualified, he is not desperate to be President. “I will never leave the PDP and I will support any presidential candidate that emerges so long the process is transparent,” Dankwambo told our correspondent. Makarfi, who was the acting national chairman of the party when it ran into turbulence, and joined others in rescuing the party from the hands of its erstwhile National Chairman, Senator Ali Modu-Sheriff, is also anchoring his campaign on his stewardship at the party and his state. The expected joining of the race by Saraki, Tambuwal and Kwankwaso, will definitely make the race interesting, but tedious for the Prince Uche Secondus-led National Working Committee. Both Saraki and the governor of Sokoto State, who are considered as big fishes, have tactically indicated their interest in running for the position. While Saraki said that “I’m consulting and actively considering it (running for the Presidency)… I believe I can make the difference,” Tambuwal said that he had been under pressure from various quarters to contest the presidency. He promised to make his decision known after a few days. So, how would the party make a probable choice from the arrays of these presidential aspirants? The Chairman of the Board of Trustees of the party, Senator Walid Jibrin, said that the board would meet with all the aspirants to discuss on whether it would be feasible to have consensus candidate. Asked what would happen if the aspirants failed to agree on a consensus, Jibrin said that there would be no other option but for them to go into election. He, nonetheless, assured those that recently defected into the party, that they would not be treated as outsiders. “But we will also not forget the roles played by our hardworking old members, especially when the PDP was almost dead,” he added.